Dachshund World Charities welcomes you to shop with us at the GreaterGood Chairty Network! We do a lot of shopping at The Animal Rescue site. Many of our donations come from these charity sites from Animals and Autism to The Veteran's Site and the Alzheimer's site. Surly,something will appeal to you for donations, yourself or gifts for your friends and families. Below, we will layout some of the best promotional codes that you can enter when making your purchase to receive things such as free shipping or free products. Shopping at the GreaterGood with DWC helps us too! For each purchase when you shop through any of the links below each charity site will pay our charity a small commission of the sale. These commissions can add up for us and help to continue our cause as we help people who help pets. Please shop with us today! 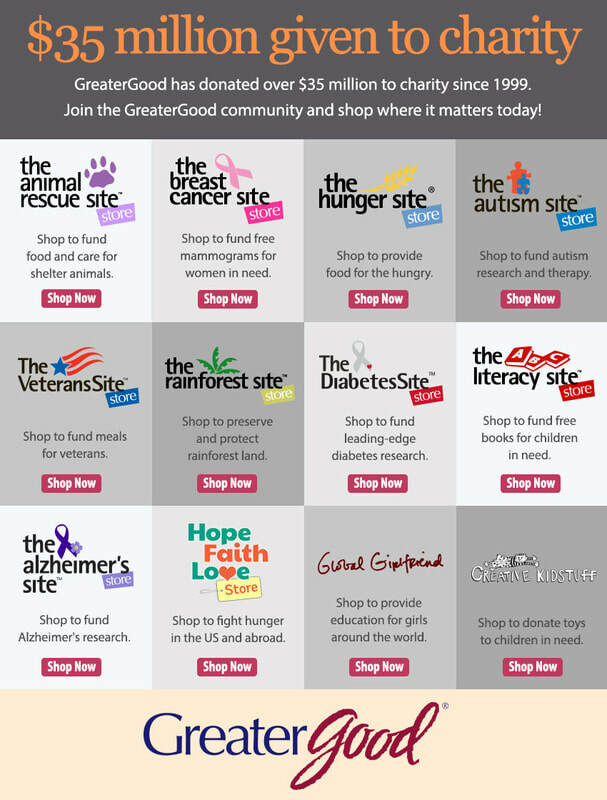 We have listed some items that you might be interested in, but you can certainly go directly to each of the many stores in the GreaterGood Charity Network and shop at your leisure for any product they are offering! Please Shop with Dachshund World Charities and Help Us Make a Difference! Toys That Encourage Active Play from Sensational Beginnings! Orders Fund Toys for Children in Need! Give Children The Tools To Bring Out Their Inner Artist! Art Supplies From Sensational Beginnings! Orders Fund Toys for Children in Need! Shop To Fight Hunger Worldwide! Every Purchase Funds At Least 25 Cups Of Food For The Hungry! Shop Handmade Fair Trade Clothes And Gifts To Help Women In Developing Countries! Shop Hope, Faith, Love Items To Fight Worldwide Hunger! Every Purchase Funds At Least 25 Cups Of Food For The Hungry! A New Baby? Check Out The Creative Kidstuff Baby Shop For Helpful Products! Orders Fund Toys for Children in Need! Traveling With Kids? Make It Easier With Creative Kidstuff. Save With $4.95 Shipping Today! Orders Fund Toys for Children in Need! Orders Fund Toys for Children in Need! Bringing You The Best In Children's Furniture From Creative Kidstuff! Orders Fund Toys for Children in Need! Be Creative With Outdoor Toys. Shop Creative Kidstuff Today and Save With $4.95 Shipping! Orders Fund Toys for Children in Need! Creative Kidstuff: Toys, Books, Costumes And Much, Much More For Children! Shop Today! Orders Fund Toys for Children in Need! Calico Critters Families, Houses, Rooms And More From Creative Kidstuff! Orders Fund Toys for Children in Need!